"Sabrina Ann Loring, Westbrook College, Class of 1976"
Westbrook College student Sabrina Ann Loring, Class of 1976, was a Medical Assisting major and a Day Hop. 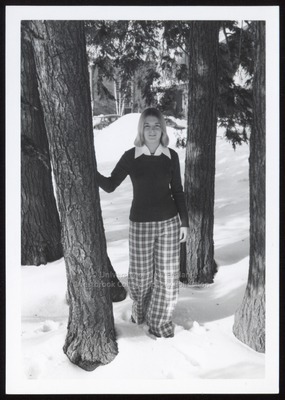 For her senior class candid photo, which appeared in the 1976 Tower Yearbook, she wore plaid, bell-bottom slacks with a wide collar white blouse and dark crew neck sweater. Her blonde shoulder-length hair is parted in the middle. Sabrina stands in the snow in the middle of a small grouping of trees on the Campus Green.